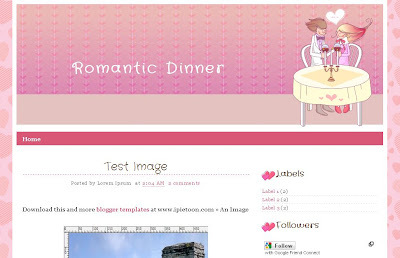 Blogger Template Romantic Dinner, couple theme series. Pink, love, heart, suitable for romantic couple. Share your love story, lovable moment to your friend on your blog, and make them excited with your blog appearance. Two columns, fixed background, cute graphic header blog. Download this cute template for free. Click download link, and click download button on box.net page. XML error message: An invalid XML character (Unicode: 0x0) was found in the element content of the document. i can assume you are an expert on this subject. Well with your permission allow me to grab your rss feed to keep up to date with forthcoming post. Thanks a million and please keep up the gratifying work. A romantic dinner with your partner gives you the opportunity to strengthen the bond between the two souls while filling you up with positive feelings. it is quite different template and it looks good. I will recommend this one to my girlfriend. Romantic diner so nice and more interesting dinner and enjoyable that can be more enjoy it in this dinner. Romantic dinner so very nice and more interesting blogger because in this blogger so very nice and enjoyable. Mostly are very like it and enjoy it in this blogger. This is dinner so very nice and enjoyable. Most of the people are very like for the romantic diner and enjoy it in this dinner. Blogger Buzz : What's New With Blogger in 2011 ?